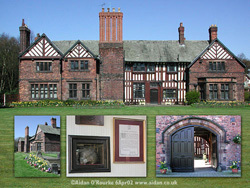 The official residence of the Roman Catholic Bishop of Manchester is at Wardley Hall at Worsley. For over 200 years it has been known as “The house of the Skull”. It has always been thought to be the skull of Father Ambrose Barlow, a Benedictine monk who was hanged, drawn & quartered at Lancaster on the 10th of September, 1641, for his religious beliefs. His head was put on display at Manchester as a warning. Francis Downes rescued the head one night & hid it at Wardley Hall. The skull was found inside a casket in the wall of the chapel at the hall during restoration work in 1775, it was “furnished with a good set of teeth & having on it a good deal of auburn hair”, Father Ambrose had auburn hair. Its not 100% proven that its Father Ambrose’s skull but it belonged to a male of the same age & stature, it dates from the same time & was severed violently & had been impaled on something sharp. Over the years unpleasant things are said to have happened to people who have tried to remove it. Previous Post8th September, 1888. Another Murder at Whitechapel. Next Post10 September 1876. Visit Cheltenham for Good Health…..and Die! 3rd August, 1983. Batman connection with Cotswold Town. 2nd August, 1835. Cotswold wife sold. 6th August, 1800. Cotswold man hanged for touching cloth.